For years, the first issue of Music K-8 magazine has included a new tune that just uses the notes B, A, and G, the most common place to begin for most recorder methods. For this collection, we are pleased to bring together six of the most popular BAG tunes to create a resource that makes teaching beginning recorder a joy! So if you are a little tired of "Hot Cross Buns," or if you are wanting to add some new spice to your early selections for Recorder Karate this year, this collection is full of possibilities. The songs come in a variety of styles, from pop rock to swing to '50s rock and Dixieland. It even includes what may have been our most talked about recorder selection, "Rockin' Around The Hound Dog's Blue Suede Shoe BAG," which lets students sing the title as a part of the tune. 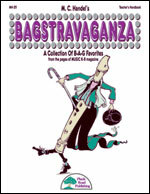 This very special collection includes BAG-O-Saurus, Popcorn BAG, BAGzilla, JitterBAG, A BAG O' Tigers, Rockin' Around The Hound Dog's Blue Suede Shoe BAG. Performance/Accompaniment CD included!